Starting on the Visitor Center Loop Trail, and throughout this hike, there are “Stay on Trail!” and “Respect Plant Restoration” type signs regularly spotted along the trail. (Regardless of whether the trail is actual trail, or wide gravel road.) It is 0.25 miles to the Jackson Drive trailhead. 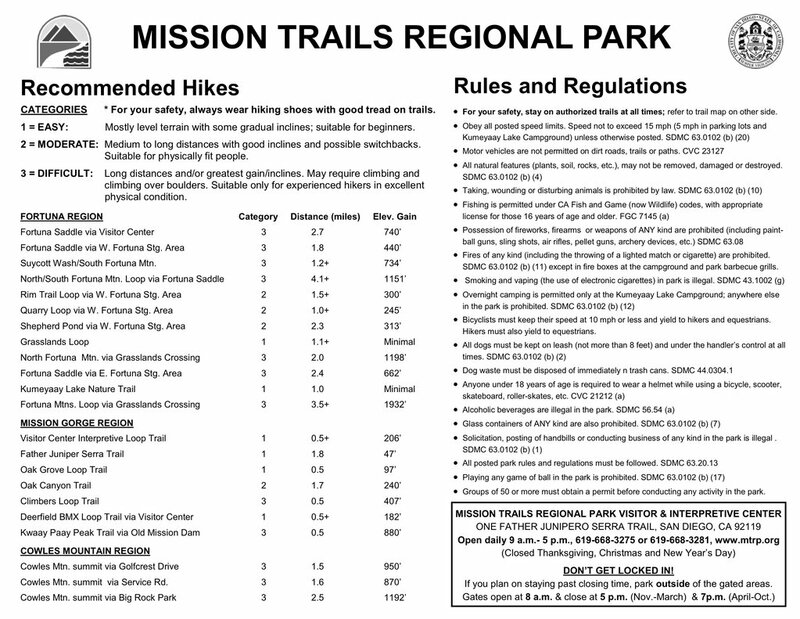 The trails in Mission Trails Regional Park are heavily travelled. Not to the sardine-packed levels of Piestewa Peak or Camelback Mountain, but heavy nonetheless. From the Jackson Drive trailhead, follow the wide gravel road — known as the San Diego River Trail — downhill to … the San Diego River. If the San Diego River happens to be running, cross using the low cement wall about 100 ft. to the west (downstream). As with any other urban trail system, there are many ways to get from A to Z. Oftentimes, many of the trails are informal and unmarked. In the case of the South Fortuna Mountain Loop, every intersection is thoroughly signed, with trail name, direction, distance to the next intersection, etc. At the top of the wide gravel road, I turned right on the Suycott Valley Trail, which is a normal single track foot trail, that starts out following a wood rail fence line. It’s a short, fairly steep descent. At the bottom of the hill, is the where the lasso handle ends and the loop begins. If you turn left, continuing north on the Suycott Valley Trail, you will be doing the South Fortuna Mountain Loop clockwise. If you turn right, to go counterclockwise, you will be heading up the Stairway to Heaven. The South Fortuna Trail follows Suycott Wash downstream for a few hunderd yards, before crossing a bridge built by the Boy Scouts. After crossing the bridge, the trail gets rockier, and begins climbing a fairly steep 150 ft. in 0.40 miles. After levelling out for a few hundred feet, where the trailside boulders are closest, you will be at the foot of the Stairway to Heaven. The Stairway to Heaven is several hundred steps to a false summit of South Fortuna Mountain. The steps do not last long, but are very steep, 300 ft. in only 0.16 miles. (Equivalent to an 1800 ft. mile.) There are very few switches. It’s basically straight up. At the false summit is a large boulder. Behind the boulder is a great view of the San Diego River and Father Junipero Serra Trail, 600 ft. below. From the false summit, the trail continues up, but at a more enjoyable gradient, to the true summit, which is marked by yet another sign. On a clear day, you could see downtown San Diego and the Pacific Ocean. From the summit, you can either head back the way you came (5.5 mi., 1450 AEG) or complete the loop (6.0 mi, still 1450 AEG). If you loop, head north off the summit. The trail down to the power lines, changes back to rough jeep trail. The power lines are in a saddle between the South Fortuna and North Fortuna summits. It is 300 ft. in 0.50 miles to the top of North Fortuna Mountain. You can then come back to the powerline, or extend the loop. Extending the loop will add 2.2 miles to your hike. The rough jeep trail that parallels the power lines is sand over rock, which is the slipperiest of surfaces. Take care with your footing. At the bottom of the powerline jeep trail, turn south on Suycott Valley Trail.There are six bridges in less than a quarter mile, as the trail winds back & forth across the wash. Just before closing the loop, there is a picnic area, well-shaded by California Live Oak. 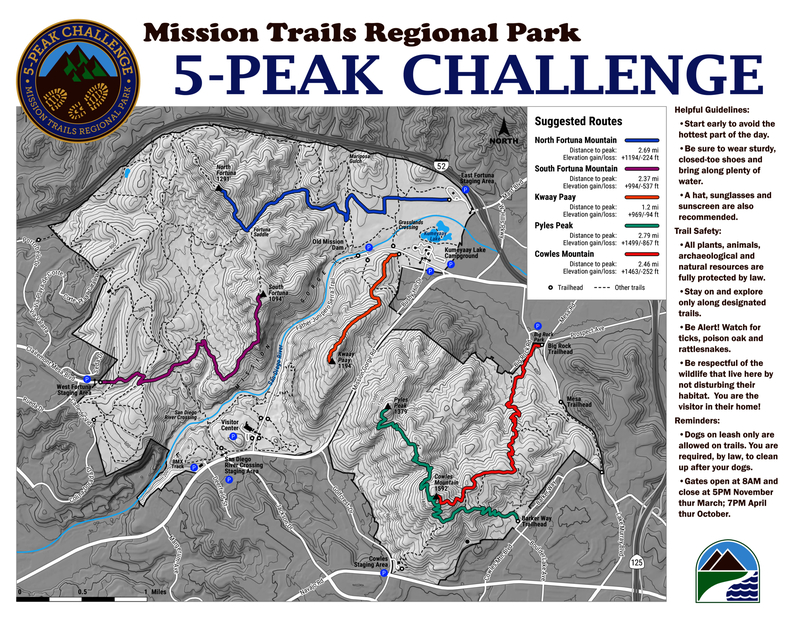 After closing the loop, backtrack the ‘handle’, uphill along the wood rail fence, down the wide gravel road to the San Diego River, then up to the Jackson Drive trailhead (or back along the Visitor Center Loop Trail, if you parked there). 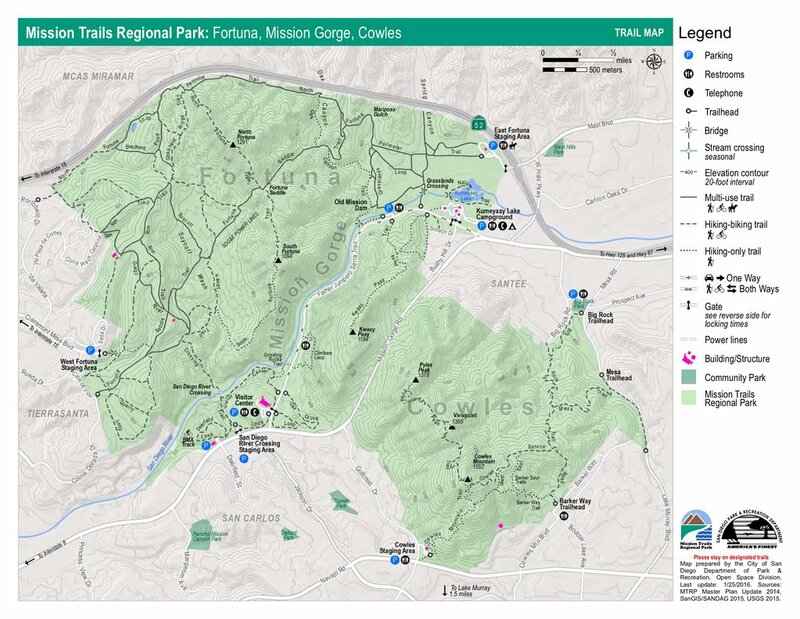 San Diego is huge, and Mission Trails Regional Park is basically in the middle, so how you get there depends on where in Southern California you are staying / located. Regardless, get on I-15. From I-15, exit Friars Rd. east (just north of I-8). Friars Rd. becomes Mission Gorge Rd. From I-15, go east four miles to Jackson Dr. Turn left into the dirt lot trailhead / overflow lot. There are no bathroom facilities. If you need a can, continue east a quarter mile to the next intersection. Turn left on Father Junipero Serra Trail, parking either along the road, or in the Visitor Center parking lot.